In this series, we'll showcase how closely renderings became reality for our clients. 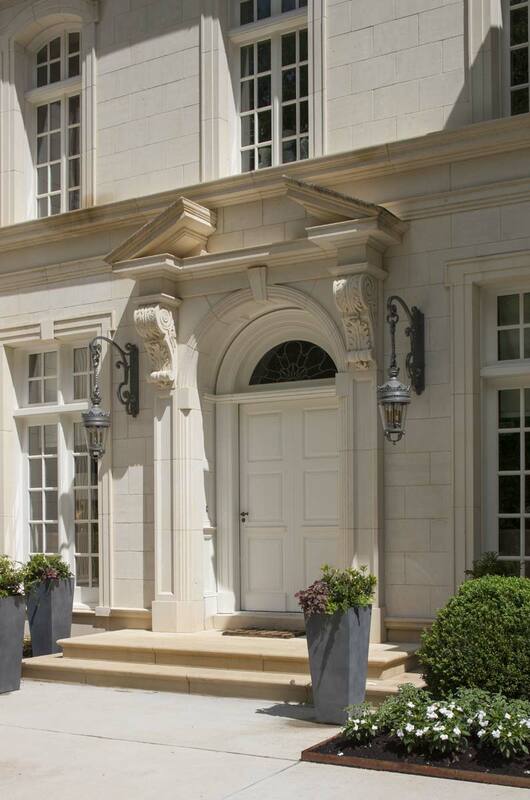 Here, the exterior of the entrance to Limestone Chateau mirrors our original architectural rendering with fantastic accuracy to classical detail. Just look at this stately facade. The beauty of classicism is its ability to transcend time and place and speak with a new voice in whatever context it finds itself. Architecture that successfully shows itself to have this kind of versatility is repeated over many years and cultures and evolves to meet the needs of each new society it encounters. Thus, when this residence was conceived as a house echoing French classicism, an architectural program was developed to incorporate the best of this historic style. Classicism is most successful when its various elements are carefully considered and care is taken in the selection of materials. This was especially true for this residence. The exterior cladding is a Texas limestone that has a soft color similar to that of French limestone. The architectural details of repeating fluted Ionic pilasters define the projecting bays while the horizontal entablatures divide the building’s massing. The main cornice with its delicate modillions is also of stone completing the authenticity of the original style. Gray Vermont slate roofing is complimented by the zinc dormers and gutters and downspouts. All the doors and windows were made to order and replicate the profiles found on 18th century French examples. As always, the fresh interpretation of a historical style within the context of modern society poses special challenges for the architect. The needs and wants of a 21st century household differ dramatically from those of three hundred years earlier. Thus, there can be tension between the exterior façade and the interior floor plan. This residence resolves these differences with a successful blend of the old and new. The floor plan is based on a symmetry that runs along two axis. The primary axis runs through the center of the house beginning at the front garden walk, through the entry door, and ending at the rear lawn. The need for a secondary axis was created upon the owner’s purchase of an important leaded glass window for the library. This window was made circa 1904 and is nine feet wide and tall. It is the focal point of the library. This second axis begins with this window and runs longitudinally through the house and concludes at the owner’s chair in the dining room. At all times, the emphasis of the floor plan and architecture is the ultimate pleasure and enjoyment of the owner. This goal continued in the library with the addition of 19th century walnut panels purchased from a house in Paris. These panels represent the best of French artistry in wood. It is a special moment when an architect has the pleasure to work with a client of taste and means in the creation of an architectural treasure. When all the forces of the architect’s creativity are combined with an owner’s zeal and vision, a special magic occurs which produces a work of enduring quality. This home represents such a moment in time and now stands as a testimony to the timelessness of French classicism and its ability to adapt itself to a new time and place in the world.